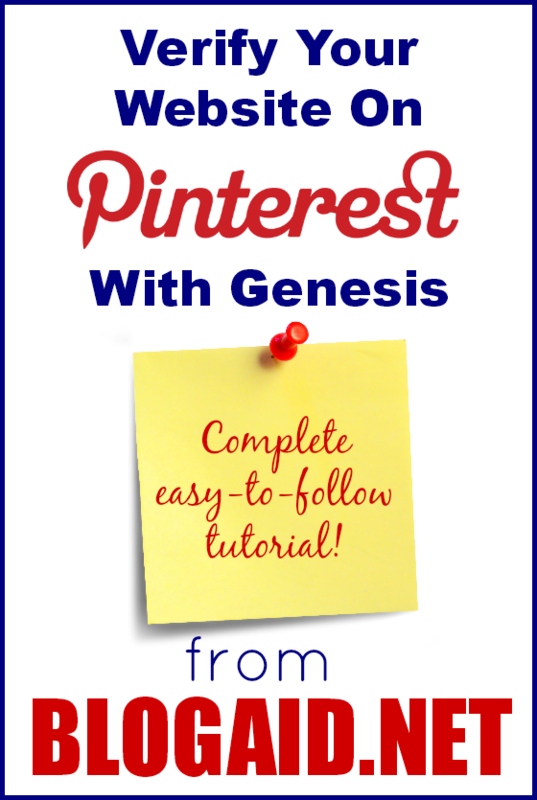 If your site is on the Genesis framework, it’s easy to verify your site on Pinterest without a plugin. Doing it the way I’ll show you in this video and written tutorial will also decrease the resource load on your site, and remove any potential security risks too. Pinterest gives you two ways to verify your site. One is to upload an HTML file and the other is to install an HTML meta tag. Now, there are multiple ways to do either of those two things. And some are better for your site performance than others. In my opinion, plugins are the worst way to do it. They are the lazy person’s way of cheating and create both a resource drain and potential security hole on your site. I’m going to show you how to do it the easy way on your WordPress site using the options already built into Genesis. NOTE: This tutorial is for a self-hosted WordPress site using a Genesis / StudioPress theme. If your site is on WordPress.com, or you are not using Genesis, you’ll want to try a different method. For those of you who prefer written tutorials with screenshots, there’s one just below this video. Both cover the same step-by-step method. Here’s the written tutorial with screenshots. 2. In the upper right, click on your name. And then on Your Profile & Pins. 3. In your profile header, click the pencil icon in the lower right. 4. Scroll down to the bottom of that pop up where you’ll find the Website section. 5. Enter your website URL (the top-level domain that you chose). Include the http:// part. 6. Click the Verify Website button. A new pop up window will appear, like the one below. You do not need to download the verification file using this method, but you can download it, just for safe keeping, or in case this method does not work for your site or host. The pop up window will now display your meta tag. 8. Copy the meta tag. Do not click anything. Simply leave this page open. Helpful Hint 1: To ensure that you copy the entire tag, don’t click and drag. Instead, click once anywhere in the field and then hit Cntl+A to highlight it all. (On Mac, that’s Command+A). Then hit Cntl+C to copy. When you’re ready to paste later, hit Cntl+V. Helpful Hint 2: If you want to keep a copy of this tag, put it in a plain text file using a program like Notepad. Don’t use a rich text editor like Word. It will actually goof the code, specifically, the quotation marks. 9. Log into your WordPress site. 10. From the admin page links in the left column, go to Genesis > Theme Settings. 11. Scroll to the bottom to the section for Header and Footer Scripts. 12. Paste the Pinterest code you copied in Step 8. This will place the Pinterest Meta Tag in the head section of all posts and pages on your site. 13. Scroll to the bottom of the page and click the Save Settings button. 14. Return to the page you left open in Pinterest in Step 8. 15. Click the Complete Verification button. ERRORS: If you get an error that there is trouble verifying your domain, click the OK button and try again. If you then get an error that the domain is already verified, then click the OK button. It can take time for your site changes to be seen, especially if you are using a caching plugin. You may have to wait a day or two to complete the verification process. 16. Close the pop up and click the Save Profile button. 17. Check your verification status. Return to your Pinterest profile. Once your site and Pinterest are tied together, you’ll see your site URL with a checkbox to the right of it in your profile header. If you haven’t done so already, you’ll want to verify your site in Google Webmaster Tools. And, you’ll want to include Pinterest in your social media listings on your G+ profile as well. These are major SEO perks. If you need help with either, contact me to help, or see my SEO and AuthorRank Video Course.